With this in-depth post you’ll learn how to caramelize onions and the science behind the process. You’ll learn the easy way, with detailed step-by-step photos and instructions, for guaranteed perfect caramelized onions. 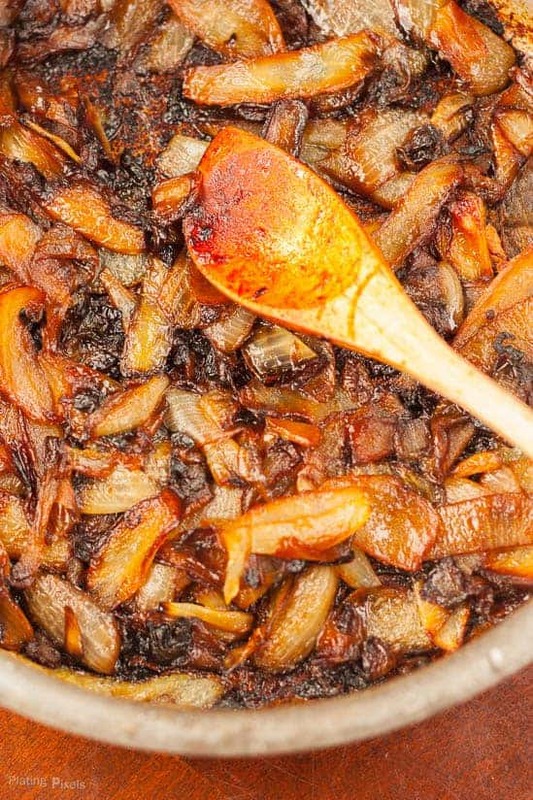 Caramelized onions can be an essential cooking ingredient. Slowly cooking onions creates chemical reactions that bring out a sweet and roasted flavor. 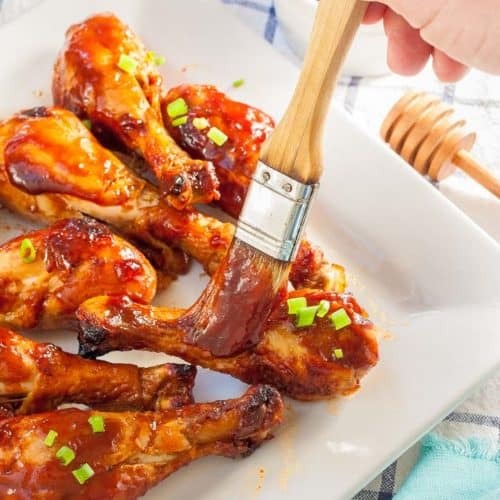 The bitter bite is removed, and you’ll have a sweet and flavorful onion base that livens up any recipe. I always semi-caramelize onions for any dish. This involves cooking for 5–7 minutes at a relatively high heat; stirring often to prevent burning. It’s just enough time to bring out flavor and reduce pungency. If you want to take this further and learn how to fully caramelize onions, this guide will do just that. Recipes often call for caramelized onions, however don’t always explain how to properly do this. Learning how to caramelize onions is easy, but takes time. The good news is you don’t need to watch them closely at such a low heat. You can start them and work on other things, or go to the next step in your recipe. Just check and stir occasionally. Sweating: There are many chemical reactions at work when caramelizing onions. 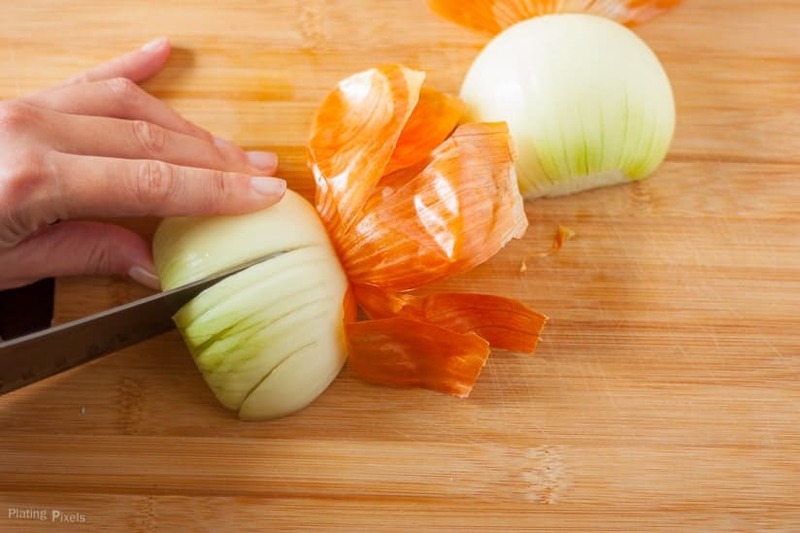 When cooking onions the internal moisture begins to steam; a process know as sweating. The liquid cells in the onion burst and breaks down the structure of the onion. Adding salt draws out more moisture. This is why onions soften as they cook. 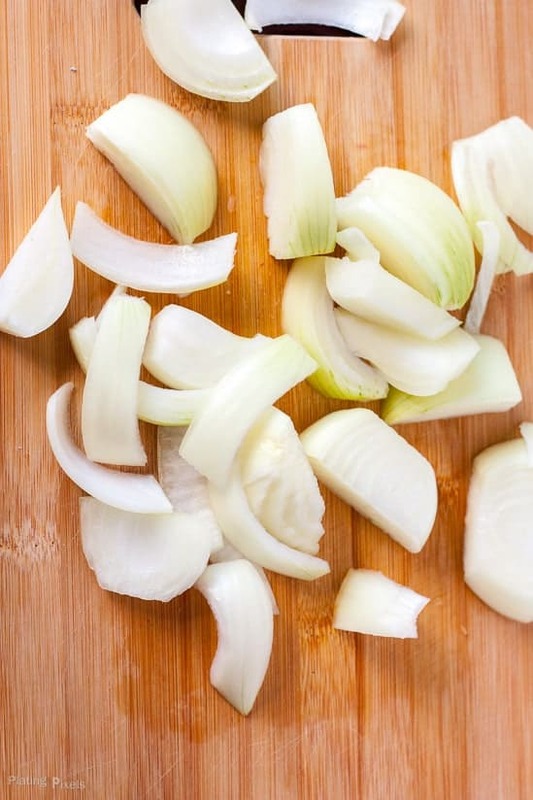 Onions reduce by roughly half, and actually start to deteriorate, when cooked longer to a caramelized state. My Steak Bruschetta with Goat Cheese and Tomato Jam recipe uses caramelized onions and roasted cherry tomatoes to create an easy savory jam. Creation of new molecules: A series of complex chemical reactions take place when onions caramelize. Heating causes the water and sugar molecules to separate. As they cook, these dehydrated sugar molecule form together to create new molecules. Eventually sweet tasting disulfides and trisulfides form. This is the same reactions that happens when you cook sugar to form caramel. The post from the Kitchn explains the bitter to sweet process in more detail. Maillard reaction creates browning: This is another reaction that happens during slow cooking for long periods of time, or cooking quickly with high heat. Any time you grill meat or toast bread in a toaster, you’re seeing the Maillard reaction in effect. Essentially amino acids (part of protein) react with sugars, like glucose and fructose, to create new compounds. These eventually create new flavors, leading to a rich, roasted taste. This process repeats itself until new compounds know as melanoidin pigments are formed. These molecules are what creates the brown color (or grilled appearance) on produce and meats. Food with high sugar (or glucose) content, like fruits, brown easily as well. Basic knowledge and time are all that’s need to perfectly caramelize onions. First peel and dice onions into roughly ½-inch pieces. You can also cut them into strips if you prefer. Heat olive oil in a large pan or skillet to medium heat. Add onions and salt. Cook for 5–7 minutes, stirring often, then reduce heat to low. We start with a higher heat to speed up the process, then cook over low heat (if we only cook on low it can take 40-45 minutes to caramelize). Continue to cook on low for at least 20–25 minutes; stirring occasionally to prevent burning or sticking. You’ll see the onions start to shrink and turn translucent. They’ll eventually turn golden brown. You may need to add another tablespoon of oil to prevent sticking. The onions will go from golden brown to a rich, dark brown (but not black). They should have shrunk by about half and may even start to break up. At this stage the onions are done and caramelized. Remove from heat and use in your recipe or as a topping. You can cook extras and store in the freezer for later use. This saves you time as some recipes only call for a small amount. Caramelize a large amount of onions at once, then freeze in separate portions in small bags. Defrost what you need in the fridge the night before. Recipes and posts on Plating Pixels teach you the science and how-to behind cooking. You’ll find quality recipes and learn about cooking at the same time. Each recipe has a specific ‘cooking tips’ section that explains part of the recipe or gives you tips that you can apply to other recipes. My in-depth recipe guide on How to Make the Best Bacon and Cheddar Stuffed Burger explains how to pick perfect meat and ingredients for juicy burgers. You’ll also learn how to perfectly assemble and grill it. 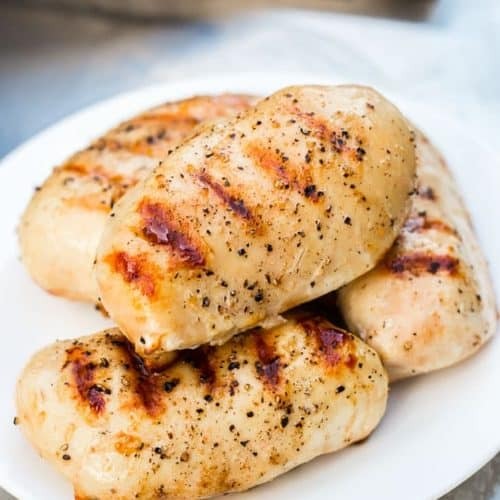 My guide on How to Bake Chicken Breast that are Moist and Tender explains a simple way to ensure moist boneless chicken breast, even in the oven. 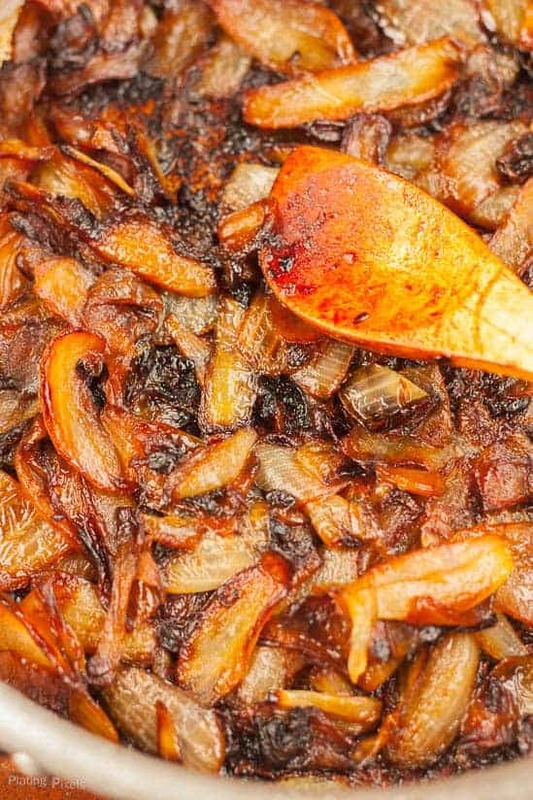 Easy detailed step-by-step photos and instructions for perfect caramelized onions. Dice onions into roughly ½-inch pieces. Heat olive oil in a large pan or skillet to medium heat. Add onions and salt, cook 4–5 minutes, stirring often. Reduce heat to low and continue to cook; stirring occasionally. 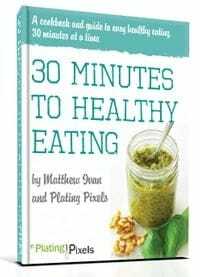 Cook for at least 20–25 minutes. You may need to add more oil to prevent from sticking. Onions are done when they are browned (or caramelized) and softened. See photos above for details and step-by-step instructions. 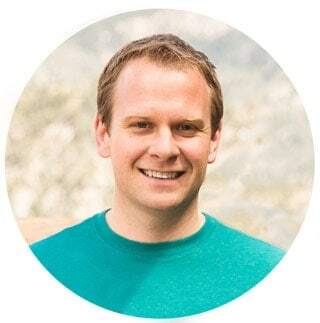 Some scientific details in this post are from Cooks Illustrated: The Science of Good Cooking. Print. 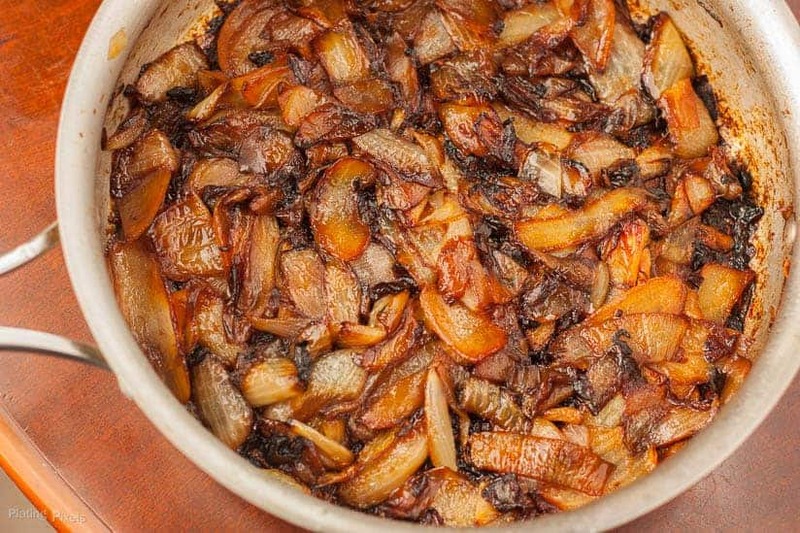 Have you made caramelized onions? What types of recipes do you use them for? i use lots of caramelized onion to make my infamous bacon jam. 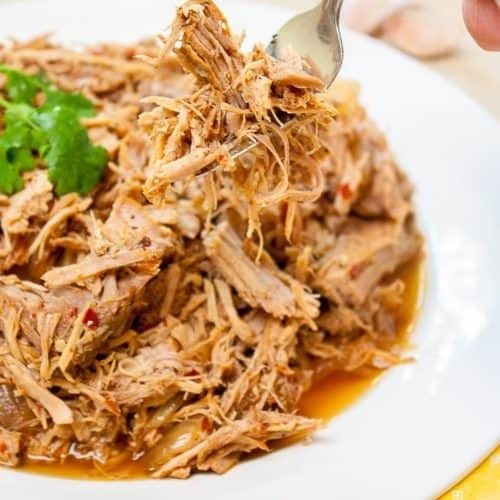 If you have time,ALWAYS opt for the long low and slow method, it does make a difference in the finished product, also a splash of balsamic vinegar or apple cider vinegar is a neat twist but it of course adds to the cooking time. I have one of those green pans so it took longer for me (40 m till the last step) but it was so worth it!!! Amazing taste! It bet it was wonderful on pork chops. Good point, it can take longer depending on the pan and exact heat you use. If you have time, lower and longer is better anyways. Thanks for the feedback Jess! This is such great info! I had no idea how to caramelize onions. I didn’t realize it took such a long time. I’m definitely going to try this and freeze some. My son and husband love onions with just about any meal, and this would be good to have on hand. To do then right it does take a long time. And this is the quick way! Otherwise they tend to brown too much. Thanks Stephanie! 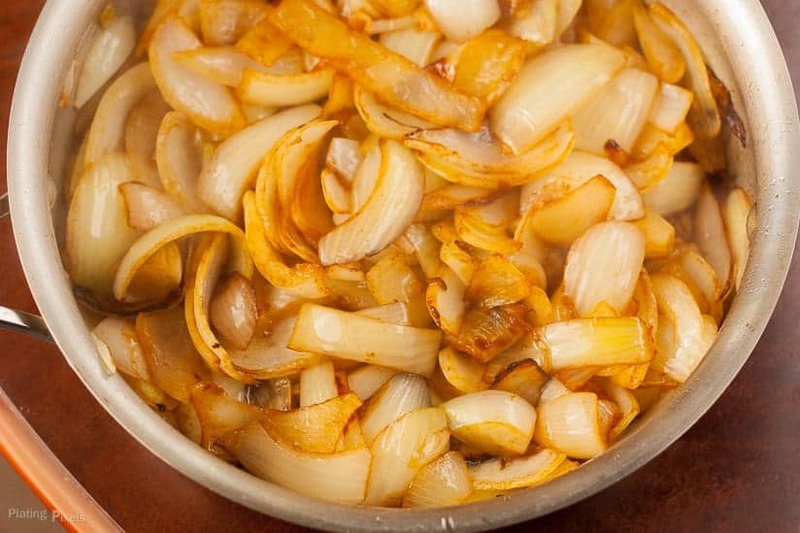 Caramelized onions are a fantastic addition to any dish. One of the “secret tricks” I was taught in chef’s school was to add a teaspoon of sugar to add in the caramelization process. You’re welcome and thank you Michelle! They’re actually pretty easy! We absolutely adore carmelized onions!! Sweet vidalias are in season here and they make the BEST topping just about anything you put on the grill!! In season veggies help for best flavor. I should look for those at my local farmers market. Thanks Becky! As a visual person, step by step photos always help me! 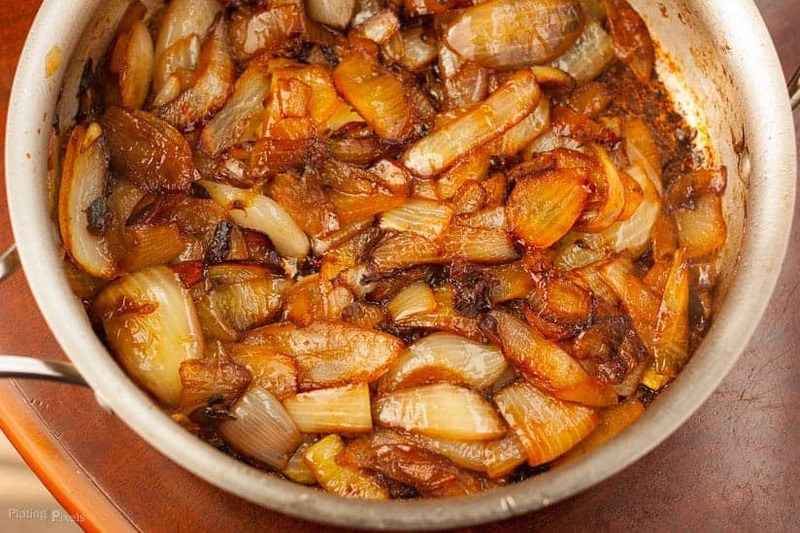 I love carmelized onions, so will be putting this on my list to do! Thank you! I think the step by step is useful too to show the progression. Thanks Joanne! I love really well caramaelized onions. Great tips! Yum! I love caramelized onions! They can be added to so many dishes–this is a great resource/recipe! Thanks! Thanks Kristi! They totally can and glad it’s helpful. These pictures are making me crave a cheeseburger with caramelized onions! So glad you shared this. I can’t wait to try this technique! Thanks and you’re welcome Becky! Now I’m hungry and want to have this on a cheeseburger too! This is a great guide! Oftentimes I either undercook them or burn them. We really love grilled onions at my house. Definitely can’t wait to try these out. They will go great with our next carne asada family party we have. Thanks Meagan! I sometimes grill onions on top of steak for added flavor. 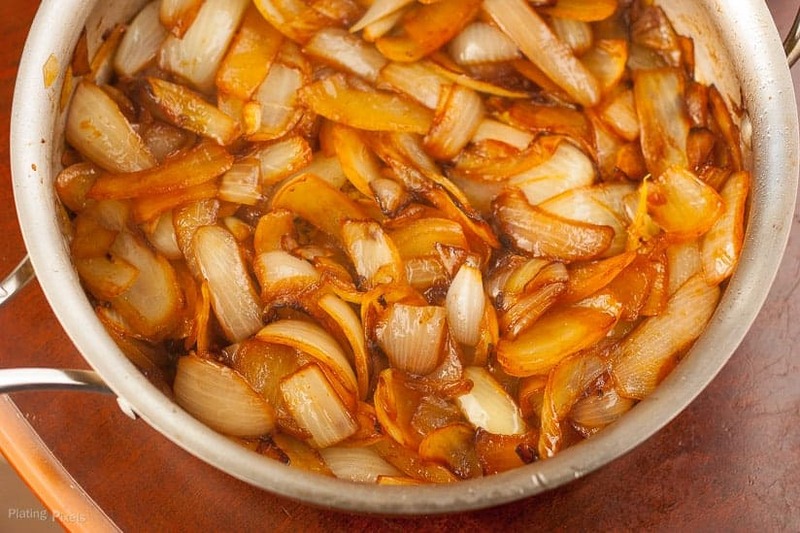 Caramelized onions are a tasty addition to so many dishes! They totally are Melanie. Thanks! We use caramelized onions quite frequently. It’s so easy to get a batch started while I’m cooking a meal. Just a few stirs is all that’s required! True Lydia! They’re pretty easy and almost take care of themselves. Absolutely LOVE caramelized onions as a topping, they take an ordinary piece of meat to extraordinary!!!! Exactly Michelle! It’s especially good on steak or in a burger.